We took a drive the other day to meet some friends. And it was a much longer drive than it was supposed to be because I somehow got confused and turned one road past where I was supposed to turn and finally realized how lost I was way too late. Boy was I lost. I had to pull over and mapquest from where I was to where I needed to be. And one long circle back later we arrived. Where did we arrive at you ask? A petting zoo! And they had horse rides too! Preston was timid at first. Kept telling me to pick him up and refused to touch any and all animals. And I became that parent. Forcing Preston to do something he was afraid of because I just knew that he was going to enjoy it. And I was right...this time. Preston loved it once he got over his fear. He chased the bunnies. Avoided the overly friendly goat. Fed the hungry ones. Refused to play with the pig. I think it threw him off because it was black as opposed to pink. 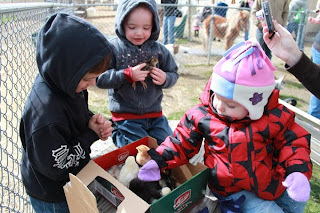 Held baby ducks and chickens. And even a turkey. He got to pet the chickens. Looked at a large tortoise. And even sat on a llama. He played on the little slide clubhouse toy. And showed me that we eat fast food way too much. Preston leaned out one of the windows in the toy and told me to order my cheeseburger and french fries. Then proceeded to hand me my cheeseburger followed by my french fries. And then told me to move along. Looks like we're going to have to work on that one. But the best part of our visit to the middle of nowhere? The thing that made getting lost and driving forty-five minutes completely worth it? Preston rode a horse! And I mean actually rode a horse! All by himself. While I waited next to the fence. He even had to wear a helmet! I didn't think it was going to happen. When I first showed Preston the horses, he was not having it. When I put him on the horse he freaked out. But as we were getting ready to leave, Preston headed over to the horses and when I asked him if he wanted to ride one he shocked me and said yes. I kept waiting for him to change his mind while the guy got him all ready to go, but he didn't. And when asked whether he wanted a short ride or a long one, Preston chose the long one. And away he went. I don't think I have ever ridden a horse and Preston already has at only two and a half! I think it's safe to say that be both had a good time at the petting zoo with friends. And afterwards we avoided fast food, we ate at Target instead! You win some, you lose some.